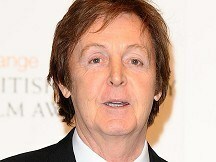 Sir Paul McCartney is to achieve a new first as he premieres his first-ever ballet score in New York. The former Beatles star has worked on a number of classical works, including his Liverpool Oratorio, but Thursday night's performance marks the first time he has written an original orchestral score for dance. Sir Paul is expected to be accompanied by fiancee Nancy Shevell - whom he is to soon marry - when he attends the show at Manhattan's Lincoln Centre. The work, named Ocean's Kingdom, will be given its first performance by the New York City Ballet at the company's autumn gala. Sir Paul is moving from Blackbird to Black Swan after meeting the company's ballet master in chief, Peter Martins, last year. The pair met at the School of American Ballet's winter gala. The music legend said of his involvement with the project: "What was interesting was writing music that meant something expressively rather than just writing a song - trying to write something that expressed an emotion. So you have fear, love, anger, sadness to play with, and I found that exciting and challenging." Sir Paul's first orchestral work, a collaboration with Carl Davis called Liverpool Oratorio, was first heard in 1991. Since then he has released Standing Stone, Working Classical and Ecce Cor Meum. He will release an album of his music from Ocean's Kingdom next month, recorded with the London Classical Orchestra.